The Philadelphia Flyers announced today that they have signed 6-3, 197-lb center Sean Couturier to a multi-year contract extension, according to general manager Ron Hextall. Couturier, 22 (12/7/1992), recorded a career-high 15 goals and added 22 assists for 37 points in 82 games for the Flyers in 2014-15. Following the season, Couturier helped lead Team Canada to the gold medal at the 2015 IIHF World Championships where he recorded three goals and added four assists for seven points in 10 games. Couturier appeared in all 82 games for the second consecutive season and has appeared in 287 out of a possible 294 NHL games. He has also appeared in 198 consecutive games, which is the third-most active streak on the Flyers (Jakub Voracek: 226 & Brayden Schenn: 208). In four seasons in the NHL, all with the Flyers, Couturier has recorded 45 goals and 73 assists for 118 points in 287 career games. His 287 games played also rank first among all players in his 2011 draft class. Couturier has also added four points (3g-1a) in 18 career Stanley Cup Playoff games. A native of Phoenix, Ariz., Couturier was selected in the first round (8th overall) by the Flyers in the 2011 NHL Entry Draft, after the club acquired the pick from the Columbus Blue Jackets in a trade on June 23, in addition to the Blue Jackets’ third-round pick (68th overall, Nick Cousins) and Jakub Voracek in exchange for Jeff Carter. 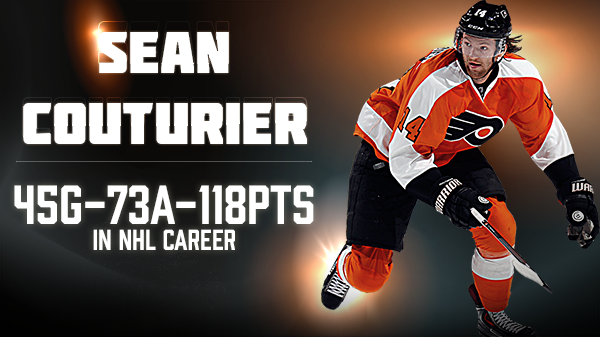 Couturier signed a two-year contract extension with the club on July 20, 2013. Fans can get a jump on reserving tickets ahead of the public single-game on sale in September by purchasing an 11-game membership now. Call 215-218-PUCK or Click Here.